Saturday of this weekend saw a Le Conte’s Sparrow reported from Floyd Bennett Field in Brooklyn. Somehow, I have never seen a Le Conte’s Sparrow, which leaves a gaping hole on my life list among many other fine Ammodramus sparrows. I bet you can imagine what I was doing early on Sunday morning! That’s right – I was at the scene at Floyd Bennett Field just after sunrise hoping to see the bird myself. Of the two who had found the bird on Saturday – Heydi Lopes and Rob Jett – only one was on the scene. Heydi had already refound the bird in the company of Andrew Baksh. Unfortunately, it was not still present. Andrew and Heydi had only managed brief, unsatisfying glimpses of the bird, and were hoping for a better look. Sadly, it was not to be. Before I had ran into Andrew and Heydi I had spent a bit of time on a short-tailed sparrow that I was desperately trying to make into the Le Conte’s Sparrow, but it just wouldn’t work. I decided to call it a Grasshopper Sparrow, a bird that is almost as difficult to get in Brooklyn or Queens as a Le Conte’s Sparrow, but it just didn’t seem right. 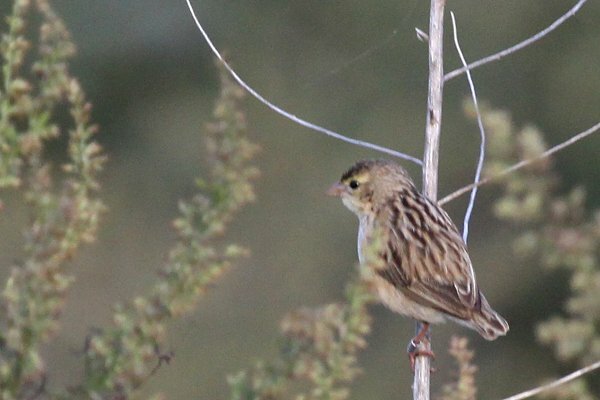 I went back to look for the bird again and this time got enough of a look – and pictures – to be sure it was neither a Grasshopper Sparrow nor a Le Conte’s Sparrow but I had no idea what it was. Fortunately, another birder on the scene, Isaac Grant, had encountered this conundrum before and was able to put a name to this tricky little creature once he saw my pictures. It is a female Orange Bishop, likely an escaped bird (note the band in the picture below) as their native range is sub-Saharan Africa and they are often kept as cage birds. The males are an unmistakable orange-and-black but the females, with their drab plumage and short tails, look enough like a Grasshopper Sparrow to drive an unprepared birder crazy. Though they look like sparrows they are weavers from the family Ploceidae or, to be more specific, they are Euplectes franciscanus. Sadly, once Heydi and Andrew realized that another short-tailed, sparrow-looking bird was around they decided that their looks weren’t good enough to count the Le Conte’s Sparrow, though at least Heydi had seen it the day before. The Le Conte’s Sparrow was not refound. So, birders beware! If you see a bird that seems like it could almost be a Grasshopper Sparrow but definitely isn’t you are likely looking at a female Orange Bishop. Don’t be fooled! Thanks for sharing the story & pics. I have seen the male before (I think in Kissena Park) but would never have ID’d your bird as the female. Thanks for the reminder to consider escaped pets when stumped with an ID. I knew you needed this bird and was VERY sorry it was not the right bird. Its all good though, we’ll find one right in our own borough and that would make that even sweeter! Does anybody remember the “bishop test”? I am so happy I found this page. I have taken several shots of this little female sparrow and like you have been trying to make it out….I am located in Southern California…mine does not have any leg i.d. band or anything…Now I can only hope to see a male and get pics of it!